You can save your environment's configuration as an object in Amazon Simple Storage Service (Amazon S3) that can be applied to other environments during environment creation, or applied to a running environment. Saved configurations are YAML formatted templates that define an environment's platform version, tier, configuration option settings, and tags. You can apply tags to a saved configuration when you create it, and edit tags of existing saved configurations. For details, see Tagging Saved Configurations. The tags applied to a saved configuration aren't related to the tags specified in a saved configuration using the Tags: key. The latter are applied to an environment when you apply the saved configuration to the environment. Create a saved configuration from the current state of your environment in the Elastic Beanstalk management console. Choose Actions, and then choose Save Configuration. Optionally, provide a brief description, and add tag keys and values. The saved configuration includes any settings that you have applied to the environment with the console or any other client that uses the Elastic Beanstalk API. You can then apply the saved configuration to your environment at a later date to restore it to its previous state, or apply it to a new environment during environment creation. You can download a configuration using the EB CLI eb config command, as shown in the following example. NAME is the name of your saved configuration. Saved configurations don't include settings applied with configuration files in your application's source code. If the same setting is applied in both a configuration file and saved configuration, the setting in the saved configuration takes precedence. Likewise, options specified in the AWS Management Console override options in saved configurations. For more information, see Precedence. Saved configurations are stored in the Elastic Beanstalk S3 bucket in a folder named after your application. For example, configurations for an application named my-app in the us-west-2 region for account number 123456789012 can be found at s3://elasticbeanstalk-us-west-2-123456789012/resources/templates/my-app/. View the contents of a saved configuration by opening it in a text editor. The following example configuration shows the configuration of a web server environment launched with the Elastic Beanstalk management console. You can modify the contents of a saved configuration and save it in the same location in Amazon S3. Any properly formatted saved configuration stored in the right location can be applied to an environment by using the Elastic Beanstalk management console. The following keys are supported. 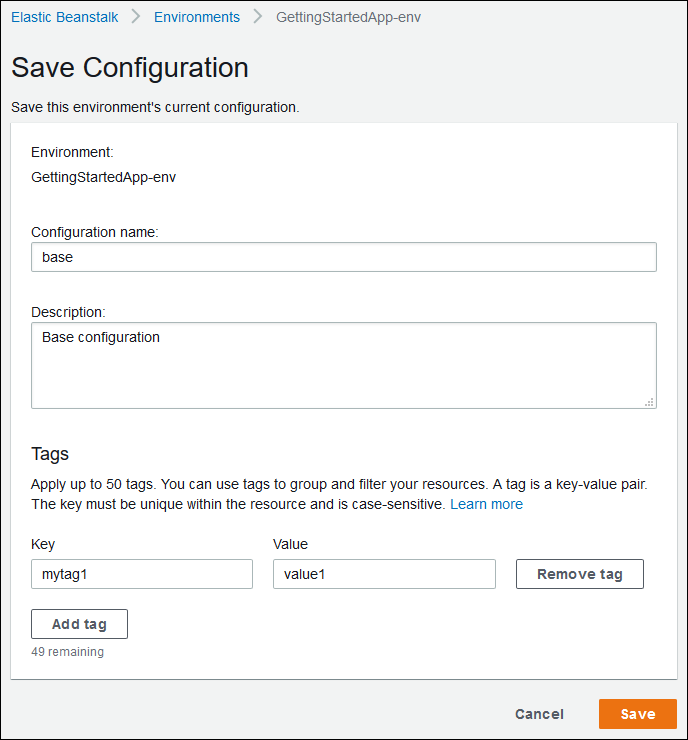 AWSConfigurationTemplateVersion (required) – The configuration template version (1.1.0.0). Platform – The Amazon Resource Name (ARN) of the environment's platform version. You can specify the platform by ARN or solution stack name. SolutionStack – The full name of the solution stack used to create the environment. OptionSettings – Configuration option settings to apply to the environment. For example, the following entry sets the instance type to t2.micro. Tags – Up to 47 tags to apply to resources created within the environment. EnvironmentTier – The type of environment to create. For a web server environment, you can exclude this section (web server is the default). For a worker environment, use the following. CName – The CNAME for the environment. Include a + character at the end of the name to enable groups. EnvironmentName – The name of the environment to create. Include a + character at the end of the name to enable groups. With groups enabled, you must specify a group name when you create the environments. Elastic Beanstalk appends the group name to the environment name with a hyphen. For example, with the environment name front+ and the group name dev, Elastic Beanstalk will create the environment with the name front-dev. EnvironmentLinks – A map of variable names and environment names of dependencies. The following example makes the worker+ environment a dependency and tells Elastic Beanstalk to save the link information to a variable named WORKERQUEUE. The value of the link variable varies depending on the type of the linked environment. For a web server environment, the link is the environment's CNAME. For a worker environment, the link is the name of the environment's Amazon Simple Queue Service (Amazon SQS) queue. The CName, EnvironmentName and EnvironmentLinks keys can be used to create environment groups and links to other environments. These features are currently supported when using the EB CLI, AWS CLI or an SDK. When using these features, you can include the saved configuration in your source code as an environment manifest instead of referencing a saved configuration stored in Amazon S3. See the corresponding topics for more information.